Tom Gauld has created countless iconic strips for the Guardian over the course of his illustrious career. A master of condensing grand, highbrow themes into panel comics, his weekly strips embody his trademark sense of humour while simultaneously opening comics to an audience unfamiliar with the artistry that cartooning has to offer. Funny but serious, these comics allow Gauld to put his impressive knowledge of history, literature and pop culture on full display - his impeccable timing and distinctive visual style setting him apart from the rest. This postcard set celebrates more than a decade of Gauld's contributions to the Guardian, with fifty of his most beloved strips, on everything from Samuel Beckett's sitcom pitches (such as Waiting for Kramer, a show where two men await the arrival of a man named Kramer who never comes), 'Procrastination for Creative Writers, a 10-Week Course' and 'Poetry Anthologies for People Who Don't Like Poems'. 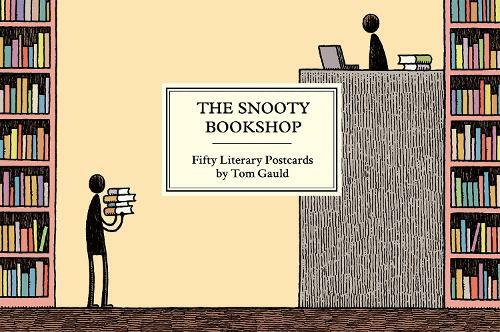 Witty and beautifully drawn, The Snooty Bookshop will make you laugh at least fifty times, guaranteed.